Jim is an e-learning developer, working with a large pharmaceutical company. His company is releasing a new antibiotic, and he was assigned the task of developing an online course on the drug. Jim was given 20 days to accomplish the task, as the course had to be ready before the medicine was launched into the market. Jim is not alone. Many online course developers find themselves in a similar situation. How can good online courses be developed rapidly? What does it take to meet fast approaching online course development deadlines effectively? The answer lies in using rapid authoring tools. These tools come with e-learning templates, which facilitate the development of high-quality technology-enabled learning materials, quickly, in a cost-efficient manner. Let us see how. This is inarguably the biggest advantage of using templates for online course development. In most cases, online course developers receive inputs that contain “common” elements such as definitions, processes, and so on which need to be presented in a certain manner. 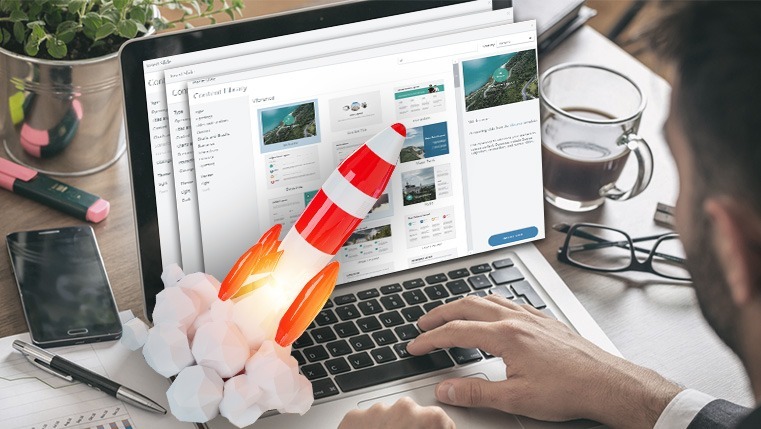 By tweaking e-learning templates built into a rapid authoring tool, you can present the elements more rapidly than developing slides containing patterns from scratch. For instance, if you need to use a jigsaw puzzle in your online course, then you can pick up a readymade template containing the puzzle and modify it to meet your specific needs. This would certainly consume less time than creating a slide containing a “jigsaw puzzle” presentation pattern from square one. Wouldn’t it? We have just seen that e-learning templates reduce the time taken to build a web-based course. A direct corollary of reduced development time is a cut in the cost of developing the course — fewer the man hours needed to develop a technology-enabled learning material, the lesser would be the expenditure incurred on creating the training resource. Furthermore, you can choose from a wide variety of in-built templates for building learning games, scenarios, and so on. These layouts are a part of the rapid authoring tool and can be very expensive if purchased separately. Templates also come with stock images and related e-learning development assets, and this goes a long way in reducing costs. You don’t require any special skills such as programming or abilities to use the technology-enabled learning resource templates available in rapid authoring tools. Templates make the assignment of functionality easy and even non-programmers can develop online courses effectively, using these resources. We all know that e-learning development is not a one man show, and in most cases, different members of the online course development team have different ideas to present the learning content. This may result in inconsistencies in the presentation of the learning content, which can affect the quality of the technology-enabled learning resource. Templates help overcome this problem effectively. A standardized e-learning template provides pre-defined fonts, logos, color combinations, and layout sizes which ensure uniformity in the presentation of the learning content. Needless to say, this goes a long way in ensuring a consistent look and feel of the course. Sometimes, even the most seasoned e-learning developer would have problems figuring out the right presentation pattern(s) for the content. Rapid authoring tools help overcome this problem by making a large number of technology-enabled learning resource templates at e-learning developers’ disposal. This provides developers with several options to present the content, to meet their learners’ needs effectively. The templates built into online course authoring tools are thoroughly tested and designed based on proven instructional design models and the best practices of web-based course development. This ensures that the course you develop is of high quality. The rigorous testing of templates also ensures that your course is free of technical glitches. More about the elimination of these issues in a moment. Software issues can have a serious impact on the effectiveness of an online course. Learners feel frustrated if they encounter problems in accessing the e-learning course, and in certain cases, may even drop out of the course. Templates provide an effective resolution to this problem. They are comprehensively tested for hassle-free access on various platforms, and this helps minimize the risk of a software malfunction. We thus see that e-learning templates help build good online courses fast, with minimal expenditure. Harness the power of these resources to develop a highly effective technology-enabled learning resource.